On this page we will dedicate postings related to the final disposition of CONCORD - The SINKEX! These photos were taken of Concord as she is nearing the end of a great life. Photos courtesy of MSC Public Affairs. Hopefully as things progress, we'll get some more photos. CVA members are on the ball, writing Congressmen in an effort to get some information and cooperation! BZ! On Wednesday 18 July 2012 CONCORD took her final voyage to the bottom of the sea. With it went many memories, sailor sweat and numerous won victories. 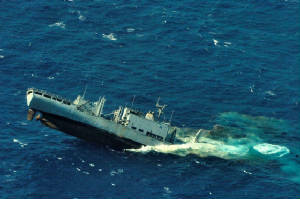 She suffered a fatal blow from a MK 48 torpedo launched by HMCS Victoria during training exercise "RIMPAC" . Though we all would have liked to step foot on our old boat one more time...........that is now impossible as she lies at least 1,000 fathoms beneath the sea. So lift your mugs and say a toast to the ship we called home. A utube video of CONCORD sinking is available on line, search CONCORD SINKING in "your browsers search engine" It's awesome especially in full screen mode ! Toronto Sun news article by Simon Kent , The USNS Concord went to the bottom of the Pacific Ocean in minutes after being hit by a torpedo fired from the submarine HMCS Victoria. (CLICK HERE)!! OUR OLD HOME NOW LIES BENEATH THE WAVES. MANY FEEL SADNESS AND REMORSE AT THE LOSS OF THIS GREAT SHIP AND THE MEMORIES THEY HAVE FOR THIS SPECIAL LADY! IF YOU WOULD LIKE TO ADD YOUR FEELINGS, SEND THEM IN AND TELL US HOW YOU FELT, AND HAVE YOUR COMMENTS ADDED HERE! home, gone. Thank you, CONCORD." Yes it was home for over 2 years and a part of our lives. We (plank owners) helped to make it ready for the missions to come and the crews to follow. She may not have had large guns nor carried troops to invade beaches but the fleet would not be able to complete its mission with out the supplies she brought to them at sea. First Then and First Now. See you all at the reunion. Concord and Niagara falls being led to their final voyage. (click to view power point show)!! 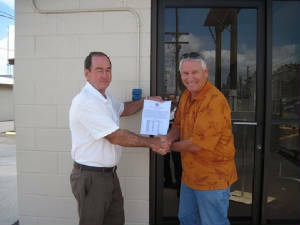 Randy Vick writes Congressman for assistance! Read Randy's letter here! Shipmate and CVA member Wayne Hostilo (FTG1 73-77) has gone above and beyond the call of duty. He recently managed to get to Hawaii and make contact with the folks charged with caring for Concord until her sinking later this year! Wayne has negotiated a deal to have a certificate placed on the bridge just prior to sinking. This certificate can be seen here and it will contain the names of CVA members. BZ to Wayne for all his hard work effort on behalf of all Concord veterans! Thanks Wayne! Ed Jemmings emailed to advise of the disposition of one of Concord's gun directors: You might find it interesting to know where one of the Directors from Concord ended up. ( think it was Concord’s forward director) The ship was the USS McCloy FF-1038 before being sold the Mexican Navy. 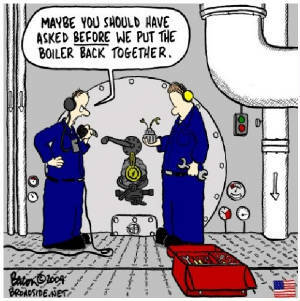 I moved the director from the Concord to the McCloy just as the FC system was being removed. I also took the console panels and the pull-out shelves with the Fire Control range finder painted on them. It’s good to know the FC system found a second life. Click here to see the Mexican ship with Concord's director!. 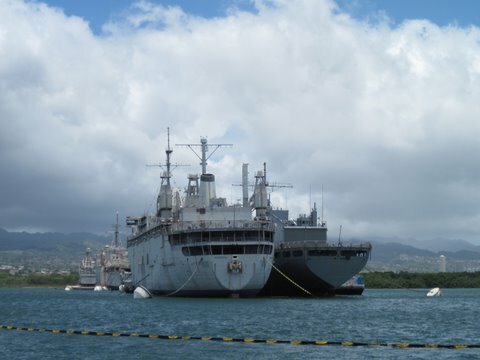 USNS Concord is designated for use in a Navy SINKEX for Fleet training purposes, not an artificial reef. The environmental preparations for SINKEX have recently begun and are scheduled to complete in August 2010. Sorry for the delay. Eric Lausten, the Congressman’s Legislative Director, handles veteran’s issues, but was out of the office last week. Obviously this has become a time-sensitive issue for you, and he and I will both try to get you an answer quickly. John,I have not heard from the staffer handling veteran's issues. Do you have his or hers email so I can contract them direct. We did find out that the ship has been turned over to the people that will do the sinking but no date as to when that will happen. Thanks for writing. Hopefully we can be of assistance. I have forwarded your email on to the staffer who handles veteran’s issues for Congressman Lipinski. He’s going to see what information he can gather and get back in touch with you. We meet at the Oak Lawn Town Hall Meeting earlier this year. I have a request I hope you can help with. I am a plank owner (commissioning crew) of the USS Concord AFS-5 back in 1968, now the USNS Concord T-AFS-5. 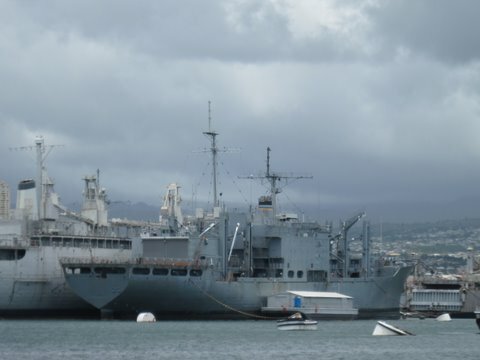 The ship is going to be sunk for a reef off the coast of Ohau. Myself and member of the Concord Association http://www.ussconcord.org/id5.html are trying to find out when it will be sunk and if pictures or a video would be available. I know the big war ships get a lot of attention when they are sunk but this ship means as much to us that served on her as the big war ships. The Concord has been in service for over 40 years and has a large crew list over those years.